With the rise of the cost of electricity we are all thinking that solar panels might be a good solution to at least reduce the energy cost of our house. On the other hand, solar panel technology and installation is not a topic that can be easily understood by most of us so when we make up our mind to install solar panels we put all our faith into the installation company! As a result selecting the right solar panel installation company becomes of paramount importance in our quest for a lower electricity bill. The list of questions provided below should be answered with ease by a good solar panel installation company and in a very detailed manner. At the same time in order to be able to assess the validity of the answers you will be getting we are also giving you the answers. If a bidding company seems unable to give you clean cut answers then it might be time to move on and start talking with another company. Will I be able to get rid of all the cost from my electricity bill or just reduce it? Eliminating your electricity bill it’s a two folded answer. The first part has to do with the number of panels that you can install at your home either on your roof or your yard and at the same time your budget size. The second part has to do with your electricity consumption level which is related to how eco friendly your house might be and if you have devices that consume a lot of energy i.e. if you have an electric underfloor heating or if you have a swimming pool. Again this will depend on the size of your solar system and how efficient it is. At the same time once again you will have to consider how much electricity you consume, the panels’ orientation, the cost of your system, state’s feed-in tariff (FIT). A good installer should be able to provide you with a good estimate on when you should break even with some even having special software that can perform projections depending on your system’s production and FIT. The area that I am planning to install my Solar Panels gets some shade is this OK? During the hours that your solar system is producing electricity i.e. 8:00 am to 4:00 pm there should be no shade since it affects the production level significantly. This should be a straight up answer that you should get from a good solar installer since any other answer can be misleading. Some installers might even suggest that in order to have your solar panel system producing uninterruptedly to move objects that create shade or suggest trimming any plants and trees that might be a problem. Is solar panel orientation important? The answer is yes orientation is important and south facing panels are the most efficient. As a matter of fact there are residential Feed in Tariff schemes that base the eligibility on a south facing roof. Of course this is the ideal and if in your case your panels cannot face the much desired south then your solar panel installer should be able to provide you with an assessment on whether you should proceed or not. What will be the tolerance of my Solar Panels Positive or Negative? Usually the new generation solar panels have a positive power tolerance which results into higher output. Do my panels need any sort of maintenance? If your installer is trying to get you signed up for an ongoing maintenance through your signed agreement that ties up the warranty of your panels with it then you might want to reconsider who you are doing business with. Residential solar panels do not have any moveable parts thus the maintenance required is minimum and usually limited to a simple cleaning by washing them with a non abrasive soap and water. In addition a visual inspection every now and then is also a good idea to make sure that everything is in place. 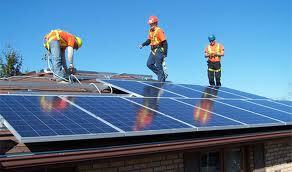 In order for a company to be able to honor your solar panel warranty it should be around for at least 15 to 20 years. Not having any physical offices is usually an indication that the company might not be around for too long. Any installer with good reputation should be able to let you get in touch with some other local clients that it has done business with and that can testify as to how much happy they are. Is the Government Rebate deducted From the Installation Cost? Any reputable solar panel installer should do the paperwork for your government rebate for you this is actually the industry’s standard. What paperwork should I be expecting from you before signing my contract? You should definitely expect to receive a written quote from your installer that includes the cost for all the parts (panels, inverter, mounting etc) of your solar system accompanied by the terms and conditions and possibly a projection of the revenue and when you should break even.